This article is about the Filipino senator informally referred to as "BBM". For other articles using this name, see BBM. Ferdinand "Bongbong" Romualdez Marcos Jr. (born September 13, 1957) is a Filipino politician and former senator in the 16th Congress of the Philippines. He is the second child and only son of former President and dictator Ferdinand E. Marcos and of former First Lady Imelda Romualdez-Marcos. In 1980, the 23-year-old Bongbong Marcos became Vice Governor of Ilocos Norte, running unopposed under the Kilusang Bagong Lipunan party of his father, who still ruled the Philippines under martial law at the time. He then became Governor of Ilocos Norte in 1983, holding that office until his family was ousted from power by the People Power Revolution and fled into exile in Hawaii in February 1986. After the 1989 death of his father Ferdinand Marcos, President Corazon Aquino eventually allowed the remaining members of the Marcos family, including Bongbong, to return to the Philippines in order to face various charges. Eventually, Bongbong ran for and was elected Governor of Ilocos Norte again in 1998. Later on, he was elected as Representative of the Second District of Ilocos Norte from 1992 to 1995, and again from 2007 to 2010. In 2010, Marcos was elected as Senator of the Philippines under the Nacionalista Party. In 2015, Marcos ran for Vice President of the Philippines in the 2016 election. With a difference of 263,473 votes, 0.64 percent difference, Marcos suffered a narrow and controversial loss to Leni Robredo. Ferdinand R. Marcos Jr., nicknamed 'Bongbong', was born on September 13, 1957, to Ferdinand E. Marcos and Imelda Remedios Visitacion Romualdez. His father Ferdinand Sr. had been Representative of the Second District of Ilocos Norte when he was born, and became Senator two years later. Marcos Jr. was only 8 years old when his father was first inaugurated as the tenth President of the Philippines in 1965, but because Ferdinand Marcos Sr.'s term was extended by his 1972 declaration of Martial Law, Marcos Jr turned 18 – the Philippines' age of legal majority – with his father still president, in 1974. His godfathers included prominent Marcos cronies Eduardo "Danding" Cojuanco Jr.,(p286) and pharmaceuticals magnate Jose Yao Campos. Although his career as a politician would formally begin at age 23 when he became Vice Governor of Ilocos Norte, his father's political profile meant that the Marcos children, particularly Bongbong and his sister Imee, became an integral part of the Marcos propaganda machine. Bongbong was thrust into the national limelight as early as when he was three years old, and the scrutiny became even more intense when his father first ran for President of the Philippines in 1965. During his father's 1965 campaign, Bongbong played himself in a Sampaguita Pictures film "Iginuhit ng Tadahana", a biopic based on the heavily-portrayal of Ferdinand Marcos in the novel "For Every Tear a Victory." The young Marcos was portrayed giving a speech towards the end of the film, in which he says that he would like to be "a politician" when he grows up. The public relations value of the film is credited for having helped the elder Marcos to win the 1965 Philippine Elections. "I'd like to pounce on the Beatles and cut off their hair! Don't anybody dare me to do anything, because I'll do it, just to see how game the Beatles are." The Beatles swore never to return to the Philippines due to the incident. (p200) Later claiming to have become a Beatles fan himself, Bongbong Marcos has said he has made overtures to surviving Beatle Ringo Star to come back and visit the country. Bongbong Marcos first studied in Institucion Teresiana and La Salle Greenhills in Manila, where he obtained his kindergarten and elementary education, respectively. In 1970, Marcos was sent to England where he lived and studied at the Worth School, an all-boys Benedictine institution. He then enrolled at St Edmund Hall, Oxford to read Politics, Philosophy, and Economics (PPE). However, despite his false claims that he graduated with a BA in Philosophy, Politics and Economics, he did not obtain a degree and instead received a Special Diploma in Social Studies, which is given to students who have dropped out of their university course. Marcos enrolled in the Masters in Business Administration program at the Wharton School of Business, University of Pennsylvania in Philadelphia, U.S. However, he did not complete the course because he withdrew from the program for his election as Vice Governor of Ilocos Norte in 1980. In the book "Some Are Smarter Than Others", author Ricardo Manapat reveals that after the EDSA revolution,investigators of the Presidential Commission on Good Government were found out that the Marcos Jr' tuition, USD 10,000 monthly allowance, and the estate he lived in while studying at Wharton were paid using funds that could be traced partly to the intelligence funds of the Office of the President, and partly to some of the 15 bank accounts that the Marcoses had secretly opened in the US under assumed names. The young Bongbong Marcos was just 15 in 1972 when his father declared Martial Law, and was in the United Kingdom because he had been sent to board at the boys-only Worth School in West Sussex. He turned 18 in 1975, a year after he graduated from Worth school. Since he was technically a minor at the exact year Martial Law was declared, Bongbong Marcos and parties connected to him have often insisted that neither he nor his sister Imee should be blamed for any wrongdoings during their father's dictatorship. However, government investigators who cataloged the wealth of the Marcoses after the 1986 ouster found that the three Marcos children, who all reached adulthood before 1980, and long before 1986, benefited significantly from what they called the "ill-gotten wealth" of the Marcos family. In addition, by the time their father was ousted from power in 1986, both Bongbong and Imee Marcos held key posts in the Marcos administration. Imee was already thirty when she was appointed as the national head of the Kabataang Barangay in the late 1970s, and Bongbong himself was in his twenties when he took up the vice-gubernatorial post for the province of Ilocos Norte in 1980, and then became Governor of that province from 1983 until the Marcos family was ousted from Malacañang in 1986. Bongbong Marcos turned 18 in 1975, three years after the imposition of Martial Law in 1972; he was twenty-three years old by the time Martial Law was lifted in 1981, and was twenty-eight in 1986 when the Marcos family was ousted by the EDSA revolution. Since he had reached the age of majority and were "already adults during the height of the martial law regime", government investigators and critics alike consider him, in the words of Congressman Edcel Lagman, "old enough when the documented atrocities and plunder were committed by the conjugal dictatorship of Ferdinand and Imelda Marcos". Marcos is generally considered to have benefitted from the Marcos family's unexplained wealth. Aside from the tuition, USD 10,000.00 monthly allowance, and the estates used by Marcos Jr. and Imee Marcos during their respective studies at Wharton and Princeton, each of the Marcos children was assigned a mansion in the Metro Manila area, as well as in Baguio City, the Philippines' designated summer capital. Properties specifically said to have been given to Bongbong Marcos, which included the Wigwam House compound on Outlook Drive in Baguio City, and the Seaside Mansion Compound in Parañaque. Marcos family visit The Pentagon in 1982. 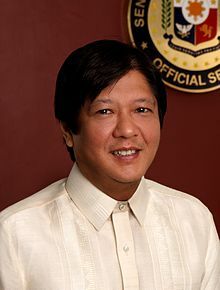 Bongbong Marcos' first formal role in a political office came with his election as Vice Governor of Ilocos Norte (1980–1983) at the young age of 23. In 1983, he led a group of young Filipino leaders on a 10-day diplomatic mission to China to mark the 10th anniversary of Philippine-Chinese relations. Marcos succeeded as Governor of Ilocos Norte (1983–1986) which he served until the People Power Revolution ousted his family from power. He then lived in political exile with his family in Hawaii, United States. During Bongbong Marcos' term, at least two extra-judicial killings took place in Ilocos Norte, a point raised by organizations like the Martial Law Victims Association of Ilocos Norte (MLVAIN) during Marcos' lost campaign for the Vice Presidency in 2016. Additionally, Bongbong Marcos' father appointed him chairman of the board of Philippine Communications Satellite Corp (Philcomsat) in early 1985. In a prominent example of what Finance Minister Jaime Ongpin later branded "crony capitalism", the Marcos administration had sold its majority shares to Marcos cronies such as Roberto S. Benedicto, Manuel H Nieto, Jose Yao Campos, and Rolando Gapud in 1982, despite being very profitable because of its role as the sole agent for the Philippines' link to global satellite network Intelsat. Philippine government investigators later found that President Marcos acquired a 39.9% share – USD 19.95 million worth – in the company through front companies under Campos and Gapud. This allowed the elder Marcos to appoint Bongbong chairman of the Philcomsat board in early 1985, allowing Bongbong to draw a monthly salary "ranging from USD9,700 to USD97,000" despite rarely visiting the office and having "no duties there". Philcomsat was one of five telecommunications firms sequestered by the Philippine government in 1986 after government investigators discovered that they had together funneled a "steady flow" of "tens of millions of dollars" out of the Philippines over the course of 10 to 15 years. During the last days of the 1986 People Power Revolution, Bongbong Marcos, in combat fatigues to project his warlike stance, pushed his father Ferdinand Marcos to give the order to his remaining troops attack and blow up Camp Crame despite the presence of hundreds of thousands of civilians there, nevertheless, the elder Marcos did not follow his son's urgings. Fearful of a scenario in which Marcos' presence in the Philippines would lead to a civil war, the Reagan administration withdrew its support for the Marcos government, and flew Marcos and a party of about 80 individuals – the extended Marcos family and a number of close associates – from the Philippines to Hawaii despite Marcos' objections. Bongbong Marcos his family were on the flight with his parents. The exiles stayed at Hickam Air Force Base at the expense of the US Government. A month later, they moved into a pair of residences in Makiki Heights, Honolulu, which were registered to marcos cronies Antonio Floirendo and Bienvenido and Gliceria Tantoco. In 2011, the South China Morning Post reported that Bongbong Marcos had admitted having "had a direct hand in trying to withdraw US$200 million from a secret family bank account with Credit Suisse in Switzerland". The paper also noted that it was Bongbong Marcos who pushed a 1995 deal to allow the Marcos family to keep a quarter of the estimated US$2 billion to US$10 billion that the Philippine government had still not recovered from them, on the condition that all civil cases be dropped – a deal that was eventually struck down by the Philippines' supreme court. Ferdinand Marcos would eventually die in exile in 1989. Marcos' Military aide, Arturo C Aruiza, would later reveal that Bongbong Marcos was the only family member present at the former dictator's deathbed. Bongbong Marcos was among the first of the Marcos family to return to the Philippines in 1991, and soon sought political office, beginning in the family's traditional bailiwick in Ilocos Norte. In 1992, Marcos was elected as representative of the second district of Ilocos Norte to the Philippine House of Representatives (1992–1995). During his term, Marcos was the author of 29 House bills and co-author of 90 more, which includes those that paved the way for the creation of the Department of Energy and the National Youth Commission. He was also instrumental in advancing the cause of cooperatives by devoting most of his Countryside Development Fund (CDF) to organizing the cooperatives of teachers and farmers in his home province. In 1995, Marcos ran for a seat in the Philippine Senate but lost. Ferdinand Marcos Jr's 1992–1995 Congressional post in the 2nd District of Ilocos Norte, was eventually taken over by his sister, Imee Marcos, in 1998 – the same year Marcos Jr became governor of Ilocos Norte. In the context of their mother Imelda Marcos' similar return to Politics as Congresswoman in Leyte in 1995, Journalists and academics noted that the Marcoses had cemented a polittical dynasty after their return from exile, despite the explicit anti-dynasty provision in Article II Section 26 of the 1987 Constitution of the Philippines. Saying that this was a common occurrence because of the way Philippine society is structured, Imee Marcos asserted in a November 2012 interview with the Sydney Morning Herald that "It's pretty feudal in the Philippines still, even though we like to fool ourselves." In the same interview, Marcos Jr. noted that the family continued to win votes despite critics, saying "We have a judgment against us in the billions. What more would people want?" He also noted that this was despite the US court's ruling that the family was liable for torture and ill-gotten wealth, which he dismissed by saying: "Well, that is one opinion and that is what the prosecutors would say." Marcos was again elected as Governor of Ilocos Norte in 1998, running against his father's closest friend and ally, Roque Ablan Jr. He served for three consecutive terms ending in 2007. According to his own website, Marcos "transformed Ilocos Norte into a first-class province of international acclaim, by showcasing its natural and cultural destinations." He also pioneered the wind power technology that serves as an alternative source of energy in Ilocos Norte and other parts of Luzon. In 2007, Marcos ran unopposed for the congressional seat previously held by his older sister Imee. He was then appointed as Deputy Minority Leader of the House of Representatives. During this term, one of the important pieces of legislation he authored was the Philippine Archipelagic Baselines Law, or Republic Act No. 9522. He also promoted the Republic Act No. 9502 (Universally Accessible Cheaper and Quality Medicines Act) which was enacted on 2009. In 1995, Marcos ran for the Senate under the NPC-led coalition, but placed only 16th. He made a second attempt for the Senate in 2010, this time securing a Senate seat by placing seventh overall. As of February 2016[update], he is the chairman of the Senate committees on local government and public works. He also chairs the oversight committee on the Autonomous Region in Muslim Mindanao (ARMM) Organic Act, the congressional oversight panel on the Special Purpose Vehicle Act, and a select oversight committee on barangay affairs. In 2014, Bongbong Marcos was implicated by Janet Lim Napoles and Benhur Luy in the Priority Development Assistance Fund (PDAF) Pork Barrel scam through agent Catherine Mae "Maya" Santos. These NGOs were found by the Commission on Audit (COA) as bogus with shady or non-existent offices. On October 5, 2015, Marcos announced via his website his candidacy for Vice President of the Philippines in the 2016 general election stating "I have decided to run for Vice President in the May 2016 elections." Marcos ran as an independent candidate. Prior to his announcement, he had declined an invitation by presidential candidate, Vice President Jejomar Binay, to become his running mate. On October 15, 2015 presidential candidate Miriam Defensor Santiago confirmed that Marcos would serve as her running mate. Marcos placed second in the tightly contested vice presidential race losing to Camarines Sur Representative Leni Robredo, who won by a margin of 263,473 votes. Marcos has challenged the results of the election. President Rodrigo Duterte has stated several times that he would resign if Marcos Jr. would be his successor instead of Vice President Leni Robredo. As with other Marcos family members who have stayed in the public eye since their return to the Philippines, Marcos Jr has received significant criticism for instances of historical revisionism, and the denial or trivializing of the human rights violations and economic plunder that took place during the Marcos administration, and of the role he played in the administration. Specific criticisms have been leveled at Marcos for being unapologetic for human rights violations and ill-gotten wealth during his father's administration. In many early instances, Marcos brushes the issue of martial law atrocites aside, as was the case in a 2012 interview with Jackie Dent of which Sydney Morning Herald, where dent recounts: "I put it to him that it has been documented that people were tortured, money was appropriated and a Hawaiian court has found against the family. He laughs. "Well, that is one opinion and that is what the prosecutors would say," he says." However, Marcos specifically belittled or denied claims of Martial Law atrocities at various instances. When victims of human rights abuses during his father's administration commemorated the 40th year of the proclamation of Martial Law in 2012, Marcos Jr. dismissed their calls for an apology for the atrocities as "self-serving statements by politicians, self-aggrandizement narratives, pompous declarations, and political posturing and propaganda." "In response to Ferdinand "Bongbong" Romualdez Marcos, Jr.'s call that teachers and students of history should make a judgment about the Marcos administration, we, the undersigned members of the Ateneo de Manila community, vehemently oppose and condemn the ongoing willful distortion of our history. We deplore the shameless refusal to acknowledge the crimes of the Martial Law regime. We reject the revision of history, disturbing vision of the future, and shallow call for "unity" being presented by Marcos Jr. and like-minded candidates in the 2016 elections. "The Marcos regime's economics of debt-driven growth was disastrous for the Philippines. The regime was not interested in inclusive development, long-term state-building, nor genuine social transformation of the country, despite its "New Society" rhetoric. Instead, Marcos was mainly concerned with perpetuating his personal hold on power by favoring family members, friends, and other cronies. Thus, Marcos simply created new elites or "oligarchs" rather than abolish them – supposedly one of his main justifications for declaring martial law. Those who dared challenge the regime's monopoly on power, whether politicians, business people, political activists, organized labor, peasants or urban poor, Church workers, students – young or old, rich or poor – were intimidated, imprisoned, kidnapped, tortured or summarily executed. "We refuse to forget the atrocities committed by the Marcos regime, and we renew our demand that the perpetrators of these crimes be brought to justice. We also reiterate our position that the government should relentlessly pursue and reclaim all the ill-gotten wealth accumulated by the Marcos family and its cronies. Moreover, victims and their families should be given justice and compensation in full. Any call for unity, most especially from the heirs of the Marcos regime which bitterly divided the country, will be empty and meaningless unless truth and justice are upheld." To this, Marcos replied: "...people have their own opinion; they have the right to their opinion. We'll agree to disagree, I guess." The Trustees of the Catholic Educational Association of the Philippines, representing the 1,425 CEAP member-schools, colleges, and universities, support the faculty of the Ateneo de Manila University in their call against the attempt of Ferdinand Marcos Jr to canonize the harrowing horrors of martial rule. "With the same fervor, we cry our hearts out, 'Never Again!'" "Great danger now lurks behind a deceptive nostalgia for a past that never really existed—that the Marcos years were a period of peace and prosperity. This is patently Marcos myth and deception. Under martial law, the country was plunged into a climate of repression and plunder and then into a social crisis that exploded in the 1980s. "...it was in fact under martial law that the communist and Moro rebellions grew in leaps and bounds. Marcos claimed to break up an old oligarchy, but martial law instead created a new type under his control, a crony oligarchy. "Economic crises characterized the Marcos years, as economists have consistently revealed, the most telling indicator was the extent of poverty. Poverty incidence grew from 41% in the 1960s to 59% in the 1980s. Vaunted growth was far from inclusive and driven by debt, which further weighed down on the nation. From 1970 to 1983, foreign debt increased twelve times and reached $20 billion (Dr. Manuel Montes, 1984). It grew at anaverage rate of 25% from 1970 to 1981. Much went to unproductive expenses like the Bataan Nuclear Plant, which was unsound and wasteful. "To say then that EDSA interrupted our becoming like Singapore is a big joke, a malicious lie. Marcos had mismanaged the economy; it was in shambles long before the EDSA revolt. From 1970 to 1980, among East Asian and Southeast Asian countries, the Philippines registered the lowest GDP per capita at 3.4% [sic] (An Analysis of Economic Crisis, ed. Dr. Emmanuel de Dios, 1984). Peace and order, a spurious claim, actually meant an iron-fisted clampdown on civil liberties. Through presidential decree and executive order backed by the full force of the military apparatus, Marcos padlocked Congress, jailed the opposition, gagged media, emasculated unions, and banned student councils. Thousands were jailed without warrant and due process, not to mention countless killings and disappeared. Yet the national crime rate climbed continuously from 183 in 1976 to 279 (per 100,000) in 1980 (De Dios, ed. 1984 citing Philippine Constabulary data). In 14 long years, repression had also stunted the growth of independent-minded new leaders from the younger generation. "We reject deception and demand accountability!" On September 20, 2018, Marcos Jr released a youtube video showing a "tete-a-tete" between him and former Senate President Juan Ponce Enrile, where he asked Enrile, who had been his father's defense minister before playing a key role in his ouster during the 1986 EDSA revolution. The video made a number of claims, which were quickly refuted and denounced by martial law victims, including former Senate President Aquilino Pimintel, former Social Welfare Secretary Judy Taguiwalo, former Commission on Human Rights chair Etta Rosales, and Palanca award winning writer Boni Ilagan, among others. It was also denounced by families and friends of Martial Law victims, such as former President Noynoy Aquino, and former Senator Rene Saguisag. Human rights lawyer Chel Diokno went as far as to say he would welcome a chance to confront Enrile in a formal debate because Enrile had claimed that his father, the former senator Jose Diokno, remained in prison because they not want to be released. The Diokno family released a statement disproving each of the video's claims, and referring to the video as a "pathetic attempt at rewriting our history". Congressman Edcel Lagman, whose brother Hermon was one of those who disappeared in 1977, during the Martial Law regime, reacted by saying "Kailangan yata dumalaw lang si Enrile at si Bongbong Marcos sa Wall of Remembrance ng Bantayog ng mga Bayani upang makita nila kung sino-sino na doon, (It seems that Enrile and Bongbong Marcos should visit the Bantayog ng mga Bayani's Wall of Remembrance to see the names) those who had heroic sacrifices to the Filipinos and were killed and involuntary disappeared during martial law." Marcos Jr is married to Louise Cacho Araneta, with 3 sons: Ferdinand Alexander III "Sandro" (born 1994), Joseph Simon (born 1995) and William Vincent "Vince" (born 1997). In December 2016, it became public knowledge that Marcos Jr has a dedicated group of online supporters calling themselves BBM Online Warriors (BOW) when he celebrated a Christmas party with them. On June 2017, Rogue magazine Philippines did an audit of different Filipino Twitter celebrity and politician accounts and discovered that Marcos Jr had the most number of fake followers at 44.19%, with other celebrity and politician accounts' fake followers ranging from just 7%-23%. According to research by VERA Files, Marcos Jr benefited the most from Fake News from the Philippines in 2017, along with Rodrigo Duterte. ^ a b c d e f g h i j k ""A dynasty on steroids"". The Sydney Morning Herald. November 23, 2012. Retrieved September 1, 2018. ^ "Senator Ferdinand "Bongbong" R. Marcos Jr". Senate of the Philippines. Retrieved October 15, 2015. ^ Ellison, Katherine W. (2005). Imelda, steel butterfly of the Philippines. Lincoln, Nebraska. ^ a b c Holley, David (February 28, 1986). "Speculation Grows: Marcos May Stay at Luxurious Hawaii Estate". Los Angeles Times. ISSN 0458-3035. Archived from the original on September 21, 2015. Retrieved August 16, 2018. ^ Mydans, Seth (November 4, 1991). "Imelda Marcos Returns to Philippines". The New York Times. Archived from the original on December 12, 2009. Retrieved August 16, 2018. ^ "List of Committees". Senate of the Philippines. February 5, 2014. Retrieved March 14, 2014. ^ a b "Bongbong Marcos running for vice president in 2016". CNN. October 5, 2015. Retrieved October 5, 2015. ^ a b Legaspi, Amita O. (September 21, 2014). "Where was Bongbong Marcos when martial law was declared in 1972?". GMA News and Public Affairs. Retrieved September 2, 2018. ^ a b c d e Seagrave, Sterling (1988). The Marcos dynasty. New York ...[etc. ]: Harper & Row. ISBN 0060161477. OCLC 1039684909. ^ Wilson Lee Flores (May 8, 2006). "Who will be the next taipans?". The Philippine Star. ^ a b Gomez, Buddy (August 26, 2015). "A romance that began with deception". ABS-CBN News. Retrieved April 27, 2018. ^ a b "Bongbong Marcos: Iginuhit ng showbiz". The Philippine Star. Retrieved April 27, 2018. ^ a b Geronimo, Gee Y. (October 12, 2015). "9 things to know about Bongbong Marcos". Retrieved April 27, 2018. ^ Garcia, Myles (March 31, 2016). Thirty Years Later . . . Catching Up with the Marcos-Era Crimes. ISBN 9781456626501. ^ a b c d e Reyes, Oliver X.A. (May 24, 2017). "The Beatles' Worst Nightmare in Manila". Esquire Magazine Philippines. Retrieved April 27, 2018. ^ "Resume of Senator Ferdinand "Bongbong" R. Marcos Jr". Senate of the Philippines. Retrieved November 12, 2015. ^ "Bongbong Marcos: Oxford, Wharton educational record 'accurate'". Rappler. Retrieved November 12, 2015. ^ Manapat, Ricardo (1991) Some Are Smarter Than Others. Aletheia Press. ^ a b c d e f Ricardo, Manapat (1991). Some are smarter than others : the history of Marcos' crony capitalism. New York: Aletheia Publications. ISBN 9719128704. OCLC 28428684. ^ Garcia, Myles (2016). Thirty Years Later... Catching Up with the Marcos-Era Crimes. ISBN 9781456626501. ^ "The Profile Engine". The Profile Engine. Retrieved November 12, 2015. ^ "The End of an Era – Handholding Ferdinand Marcos in Exile". Association for Diplomatic Studies and Training. Retrieved November 12, 2015. ^ Cornelio, Jayeel Serrano (April 15, 2016). "Why is it difficult for Bonging Marcos to apologize?" ^ Salvador, Lenville (February 26, 2016). "Ilocos Martial Law victims say no to Bongbong Marcos". Northern Dispatch Weekly. Archived from the original on June 28, 2017. Retrieved April 27, 2018. ^ a b c d e f Scott, Ann (March 17, 1986). "U.S. auditors to examine documents related to Philippines' alleged diverted funds". UPI. Retrieved April 27, 2018. ^ a b c Butterfield, Fox (March 30, 1986). "Marcos's Fortune: Inquiry in Manila Offers Picture of How it Was Acquired". The New York Times. Retrieved May 29, 2018. ^ de Mund o, Fernando (February 25, 2013). "US set 5 conditions to save Marcos". Philippine Daily Inquirer. ^ Lustre Jr., Philip (February 25, 2016). "Ferdinand Marcos: His last day at the Palace". CNN Philippines. ^ a b Duet for EDSA: Chronology of a Revolution. Manila, Philippines: Foundation for Worldwide People Power. 1995. ISBN 9719167009. OCLC 45376088. ^ Holley, David (February 27, 1986). "Marcos Party Reaches Hawaii in Somber Mood". Los Angeles Times. Archived from the original on October 22, 2015. Retrieved August 16, 2018. ^ Richburg, Keith B.; Branigin, William (September 29, 1989). "Ferdinand Marcos Dies in Hawaii at 72". The Washington Post. Retrieved August 16, 2018. ^ Aruiza, Arturo C., (1991). Ferdinand E. Marcos : Malacañang to Makiki. Quezon City, Philippines: ACA Enterprises. ISBN 9718820000. OCLC 27428517. ^ Dizon, David (January 21, 2016). "If Marcos wins, PH will be laughingstock of the world: Osmena". ABS CBN News. Retrieved May 11, 2018. ^ "Smell good, Feel good". Blackwater. Archived from the original on November 17, 2015. Retrieved November 12, 2015. ^ a b c "Highlights: Bongbong Marcos as legislator". Rappler. Retrieved November 12, 2015. ^ "Page not found". Archived from the original on January 23, 2018. Retrieved November 12, 2015. ^ a b "About Bongbong Marcos". Bongbong Marcos. Retrieved November 12, 2015. ^ "Marcos hits alleged election cheating". United Press International. Retrieved November 12, 2015. ^ Curato, Nicole (October 1, 2012). "What is wrong with political dynasties?". GMA News Online. Retrieved September 1, 2018. ^ "Ferdinand Bongbong R. Marcos Jr. Biography in California". digwrite. Archived from the original on November 18, 2015. Retrieved November 12, 2015. ^ "Road Trip to Ilocos Norte 7: Bangui's Wind Farm". Biyaherong Barat. Archived from the original on November 18, 2015. Retrieved November 12, 2015. ^ "With wind farm, Noy needs no special powers". The Philippine Star. Retrieved November 12, 2015. ^ Bongbong Marcos - Campaign 2007 (English). Retrieved November 12, 2015 – via YouTube. ^ "Priest's rival claims victory". Philippine Daily Inquirer. May 17, 2007. Archived from the original on February 22, 2013. ^ "R.A. 9522". lawphil.net. Retrieved November 12, 2015. ^ "G.R. No. 190837, March 05, 2014 – Republic of the Philippines, Represented by the Bureau of Food and Drugs (Now Food and Drug Administration), Petitioner, v. Drugmaker's Laboratories, Inc. and Terramedic, Inc., Respondents. : March 2014 – Philippine Supreme Court Jurisprudence". Chanrobles Virtual Law Library. Retrieved November 12, 2015. ^ "Ferdinand 'Bongbong' Marcos". politiker.ph. Retrieved November 12, 2015. ^ "16th Congress – Senate Bill No. 1186". Senate of the Philippines. Retrieved November 12, 2015. ^ a b Mendez, Christina (December 9, 2009). "=Nacionalista Party breaks alliance with Kilusang Bagong Lipunan". The Philippine Star. ^ Echeminada, Perseus (November 24, 2009). "Bongbong ousted from KBL after joining Nacionalista Party". The Philippine Star. ^ Santos, Matika (May 26, 2014). "20 senators, 100 congressmen named on Napoles' long list". Philippine Daily Inquirer. ^ Carvajal, Nancy (May 14, 2014). "25 senators on Luy list". Philippine Daily Inquirer. ^ Napoles, Janet Lim. "Affidavit of Janet Lim Napoles" (PDF). Philippine Daily Inquirer. Retrieved May 26, 2014. ^ Cabacungan, Gil (September 23, 2013). "Abad should have checked with me–Marcos". Philippine Daily Inquirer. ^ Macaraig, Ayee (September 10, 2013). "Marcos: Fund misuse may be beyond PDAF". Rappler. ^ a b Cayabyab, Marc Jayson (April 6, 2016). "Bongbong Marcos sued for plunder over pork barrel scam". Philippine Daily Inquirer. ^ Lozada, Aaron (October 5, 2015). "Bongbong to run for VP". ABS-CBN News and Current Affairs. Retrieved October 5, 2015. ^ Antiporda, Jefferson (October 5, 2015). "Marcos throws hat in VP derby". The Manila Times. Retrieved October 8, 2015. ^ Torregoza, Hannah (October 6, 2015). "Bongbong declares VP bid in 2016, gets Duterte's assurance of support". Manila Bulletin. Retrieved October 6, 2015. ^ Hegina, Aries Joseph (October 15, 2015). "Miriam Santiago confirms Bongbong Marcos is her vice president". Philippine Daily Inquirer. Retrieved October 15, 2015. ^ Rosario, Ben; Santos, Jel (May 27, 2016). "Duterte victory affirmed; Robredo wins VP race on husband's birthday". Manila Bulletin. Retrieved May 28, 2016. ^ Pasion, Patty (May 27, 2016). "Duterte, Robredo to be proclaimed next week". Rappler. Retrieved May 28, 2016. ^ Batino, Clarissa; Calonzo, Andreo (August 15, 2018). "Philippines' Duterte Won't Stop Talking About Quitting". India: Bloomberg Quient. Retrieved August 15, 2018. ^ Nicolas, Bernadette D. (August 16, 2018). "'Duterte may resign if Bongbong wins protest'". BusinessMirror. Retrieved September 3, 2018. ^ de Ynchausti, Nik (September 23, 2016). "Why has Marcos' propaganda lived on?". Esquire Magazine Philippines. Archived from the original on September 27, 2016. Retrieved September 27, 2016. ^ a b "Report of an Amnesty International Mission to the Republic of the Philippines 22 November – 5 December 1975" (PDF). Amnesty International Publications. September 1976. ^ a b "PCGG welcomes Singapore court decision on Marcos' Swiss funds". Rappler. January 4, 2015. ^ a b Ayee Macaraig (August 26, 2015). "Marcos on dad's regime: What am I to apologize for?". Rappler. ^ Elizabeth Marcelo (February 10, 2016). "Bongbong Marcos unfazed by anti-Martial Law critics". GMA News Online. ^ Ayee Macaraig (August 16, 2015). "Bongbong on 2016: No downside to being a Marcos". Rappler.com. ^ Elizabeth Marcelo (February 29, 2016). "Bongbong Marcos to critics: Allow young voters to make own judgment". GMA News Online. ^ a b Tan, Kimberly Jane (September 21, 2012). "Martial Law in the eyes of the late strongman Marcos' son". GMA News. ^ a b Gavilan, Jodesz (September 21, 2018). "'Distortion of truth': Diokno family slams Bongbong Marcos, Enrile". Rappler. Retrieved October 1, 2018. ^ Quimpo, Susan (October 14, 2012). "Enrile's memoir gives me sleepless nights". GMA News. ^ Leila B. Salaverria (February 27, 2016). "Bongbong: Let historians, not politicians, judge Marcos rule". Philippine Daily Inquirer. ^ Elizabeth Marcelo (February 26, 2016). "Leave it to Professors – Bongbong to PNoy: Let history judge Marcos era". GMA News Online. ^ "Bongbong: Let historians judge my father's regime". ABS-CBN News. February 27, 2016. ^ "Ateneo de Manila Community Stands Up Against Historical Revisionism of Martial Law". Ateneo de Manila University. March 3, 2016. ^ "We are not blind to the darkness and oppression of Marcos years! Statement of concerned members of the Ateneo de Manila University on the Martial Law regime and Bongbong Marcos' revision of history" (PDF). Ateneo de Manila University. March 4, 2016. Retrieved February 27, 2017. ^ Paterno Esmaquel II (March 7, 2016). "Ateneo presidents slam Bongbong Marcos 'revision of history' – Heads of Jesuit-run universities join nearly 530 other signatories against 'the darkness and oppression of the Marcos years'". Rappler. ^ Yuji Vincent Gonzales (March 2, 2016). "Ateneo professors slam Bongbong Marcos' 'revision of history'". Philippine Daily Inquirer. ^ Filane Mikee Z. Cervantes (March 2, 2016). "Ateneo professors thumb down historical distortion of martial law regime". Interaksyon.com. Archived from the original on March 7, 2016. ^ Maricar Cinco (March 3, 2016). "Marcos to Ateneo faculty: 'Let's agree to disagree'". Philippine Daily Inquirer. ^ "1,400 Catholic schools back call vs 'Marcos snares, Imeldific lies'". Rappler. March 8, 2016. ^ "1,400 Catholic schools slam 'Marcos snares, Imeldific lies'". ABS-CBN News. March 8, 2016. ^ University of the Philippines Department of History (March 28, 2016). "Malakas at Maganda: Marcos Reign, Myth-Making and Deception in History". ^ Aries Joseph Hegina (March 30, 2016). "Marcos deception seeks to evade accountability—UP Dept. of History". Philippine Daily Inquirer. ^ Rosette Adel (March 30, 2016). "UP history profs slam 'mythical' golden era under martial law". The Philippine Star. ^ Viray, Patricia Lourdes (September 21, 2018). "Fact-checking Enrile's tete-a-tete with Bongbong Marcos". The Philippine Star. Retrieved October 1, 2018. ^ Layug, Margaret Claire (September 23, 2018). "Enrile challenges critics to a debate; Chel Diokno says 'anytime'". GMA News Online. Retrieved October 1, 2018. ^ Legaspi, Amita (September 21, 2018). "Enrile's claims are pathetic attempt to rewrite history —Diokno family". GMA News Online. Retrieved October 1, 2018. ^ Quismorio, Ellson (September 24, 2018). "Visit Bantayog Memorial, Edcel tells Johnny, Bongbong". Manila Bulletin News. Retrieved October 1, 2018. ^ Romero, Paolo (October 26, 2018). "Enrile apologizes to Martial Law victims, blames 'unlucid intervals'". The Philippine Star. Archived from the original on October 31, 2018. Retrieved October 31, 2018. ^ Catolico, Gianna Francesca (December 15, 2016). "LOOK: Bongbong Marcos hosts Christmas party for online supporters". Philippine Daily Inquirer. ^ "Who has the Most Fake Followers on Filipino Twitter?". Rogue magazine Philippines. Retrieved June 2, 2017. ^ "VERA Files Yearender: Who benefited most from fake news, and other questions, answered in three charts". Vera Files. December 22, 2017. Wikimedia Commons has media related to Bongbong Marcos. # — Ponce Enrile was also the Senate president of the 14th Congress. ##—Estrada is in acting capacity after Ponce Enrile takes his resignation. ### —Zubiri resigned from office on August 3, 2011, replaced by Pimentel afterwards. #### — Vacant due to election of Benigno Aquino III to the presidency. This page was last edited on 21 March 2019, at 06:31 (UTC).